Our advanced 300-hour program delves deeply into building strength in technique, honing your voice, diversifying your practice, growing your own opportunities, and cultivating community. From a practiced foundation, we teach an advanced depth of anatomy, alignment, and sequencing. Learn the technical precision behind our verbal cues, discover adjustments and modifications for fine-tuning asanas, and acquire a practiced understanding in your own body of the answers you’ve sought. Expect to leave with an enormous new network of support and inspiration. Discover your truth as a teacher. Leave with the tools to embody it. This 300-hr training is a dedicated, immersive experience in Koh Samui, Thailand. Set aside the time to completely disconnect and discover a new routine and pace of learning. Graduates receive Yoga Alliance RYT 300 qualification, the international standard for teaching. Alumni also receive a 25% discount off future trainings and continued access to our community. This program is designed for yoga teachers or serious students with a strong foundation. Trainees must have a 200-hr certification OR six months consistent yoga teaching experience. This may include any mix of public classes, private sessions, corporate classes, online videos, or charity classes. Our curriculum is composed of modules organized into four key sections: The Practice, The Study, The Mind, The Business. Expect multiple daily practices and lessons, running from 7am-7pm. Our daily practices are dedicated to challenging trainees and strengthening our foundation. We will practice heightening the mind-body connection, deepening the breath, and finding balance between strength and flexibility. We will sweat profusely and cultivate a spirit of lighthearted play through creative Vinyasa flow sequencing, arm balances, and inversions. Most daily practices will begin or end with light pranayama and meditation. 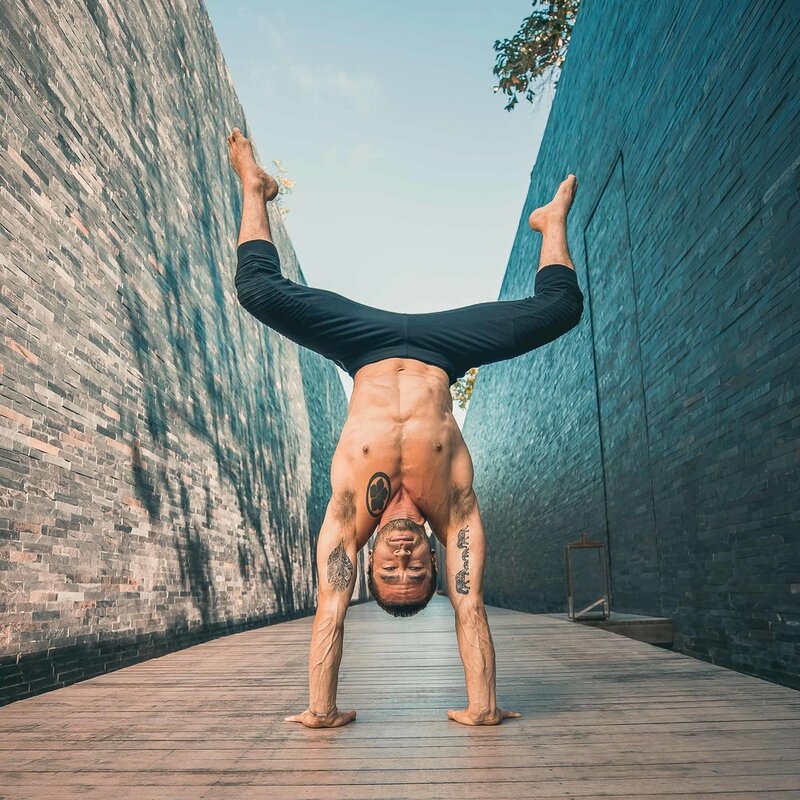 Inversions and arm balances are a growing trend around the globe. We love them because they challenge us physically and mentally. Many teachers however, do not feel confident teaching these advanced sequences unless they have mastered them in their personal practice. Together, we will work on giving trainees the tools they need to understand the journey towards these advanced postures. These tools include interactive strength and flexibility exercises, partner inversion work, and independent wall and prop use. Trainees will cultivate confidence in guiding future students into these postures with effective class sequencing, safe spotting, adjustments, and efficient verbal cues. Acro and partner yoga are great ways to cultivate community, build trust, and strengthen communication. We will apply this practice to break the ice and building quick camaraderie. The yoga world is filled with alignment cues and belief systems that often contradict one another. Through our daily asana alignment study, we will focus on individual postures, highlight common misalignments, study the effects of poses on the body, discuss cue trends, and learn key contraindications. We believe that hands-on adjustments are a valuable instrument of communication for a teacher and a key way for students to learn correct engagement. We will practice safe and effective spotting, adjustment, and modification tools to help you approach hands-on adjustments with knowledge and respect. We teach anatomy focused on functional biomechanics in regards to asanas and misalignments. We will grow a solid understanding of the human body, enhancing your knowledge and teaching abilities. Learning anatomy in conjunction with alignment is key to helping you teach your students how to flow safely. The FitFlowFly Sequence is a Vinyasa-inspired flow. It is an accessible but challenging flow that is easily tailored to different class lengths and levels. Upon graduating, you will have practiced, dissected, and mastered this foundational template for teaching. In our sequencing lectures, we will break down the FitFlowFly Sequence in detail. We will also discuss sequencing construction and methods to help you modify creatively with your own voice as you gain teaching experience. As a core part of the curriculum, we expect students to practice teaching. We will provide many hands-on opportunities to practice teach cues, sequencing, teaching aids, and adjustments. Many of us look to yoga for its physical benefits when yoga tradition spans far beyond just the physical. We will cover key aspects of history, philosophy, and traditions such as pranayama, meditation, kriyas, chakras, and kirtan. Through daily practical use, we will learn accessible ways to integrate these traditions and philosophies into our own practices. We will also learn methods of mindfully introducing these concepts to our students. In addition to all of the modules and daily offerings, we would love for this experience to be an opportunity to deepen your connection to the SELF. Through philosophy and conversation, we will weave in concepts that apply ancient yoga philosophy to daily life. Yoga as a business and industry has grown exponentially over the past ten years. What was once an industry with limited outreach now has opportunities for entrepreneurs, teachers, clothing designers, management consultants, online personalities, healers, therapists, world travelers, and more. We aim to equip all trainees with the foundation to be successful. Sample topics include owning and operating a studio, specialized workshops and festivals, travel teaching, creating yoga products, and producing online content. In this world of many voices, it is key to find your own. We will discuss the importance of social media branding and learn how to find your how, what, and why. We are pleased to partner with Vikasa Yoga Retreat to offer on-site accommodations for students at a discount. Our negotiated rates are all-inclusive of three healthful meals per day, served buffet-style for our training group. Vikasa offers a range of rooms from private rooms to rooms with two twin beds, to be shared with one other trainee. If you are interested in on-site accommodations, click here to review room options and rates. Please look for a private booking link in your email once we’ve confirmed your registration to reserve your room. *Please note that accommodations are a separate fee from tuition. Students are not required to live on-site and may choose to arrange their own accommodations. A nominal deposit is required to reserve your spot with each registration. We also offer early-bird specials for a significant discount from overall tuition. Prices are all-inclusive. There are no hidden fees or extras before or after arrival. All materials are included. We offer an optional three-part payment plan, splitting total fees into three equal payments made in the months leading up to the course. Full payment is due three months prior to the course start date. Extended payments plans may be available upon request. All deposits are non-refundable for any reason. Aside from the deposit, your remaining payments are 100% refundable, for any reason, until sixty (60) days prior to course start date. Within sixty days prior to course start date, all fees become 100% non-refundable. In special cases, some or all of your fees may be transferable to a future course. To initiate a refund, please contact us directly. Under no circumstances does payment ensure certification. All certifications are merit-based only and students must meet all requirements for graduation. We do not sell certifications. Check with your local tax advisor to learn whether professional yoga training may be deducted as a business expense in your jurisdiction. This may aid in a considerably lower overall total. If you need an official tax invoice, just ask. We’re happy to help!